File Form 2290 for Heavy Vehicles annually by the end of the August 31st. The heavy vehicle which is running on the public highways must File IRS Form 2290 by the August 31st for the current tax period. The present tax period considers from July 1st to June 30th of the next year. 2290 Tax must be filed advance for the entire year to freely run on the public highways. If you place any new vehicle on the road then you must File IRS 2290 by the end of the next month. Also, you need to pay the HVUT 2290 for the new vehicle till the current tax period ends by the end of the next month. It is necessary to File & Pay Heavy Highway Use Tax within 2290 Due Date, if not you need to pay interest and penalties. Check the above table to File IRS 2290 Online. Finish your filing and HVUT payment within the 2290 Due Date to not impose to pay interest or penalties. If any due date falls on Saturday or Sunday then you can file on next business day. Example: If you run your taxable vehicle on a public highway in the July month then you must File & Pay Heavy Vehicle Use Tax by the August 31st of the current tax period from July 1st, 2019 to June 30, 2020. If you purchased a vehicle in this month and started running immediately(in the same month) then you need not to pay the Highway Use Tax 2290 for the month of sale. For privately used vehicles, if they bought and started in the same month of the sale then you need to pay Heavy Vehicle Use Tax for the month of sale. If a heavy vehicle is sold which is already registered and paid Form 2290 Heavy Use Tax. In this case, the seller can claim a credit for the vehicle he has sold. The 2290 Schedule 1 Proof is the only way to mention the ta amount you paid to an IRS. Deduct the tax from the whole tax paid to an IRS and the tax from the month of the sale. Then, you can calculate and credit the amount from an IRS. The name and address of the purchaser, Claiming credit of a seller along with the refund tax period for the months remained in the current tax period. IRS Schedule 1 Proof is also mandatory to claim a credit. 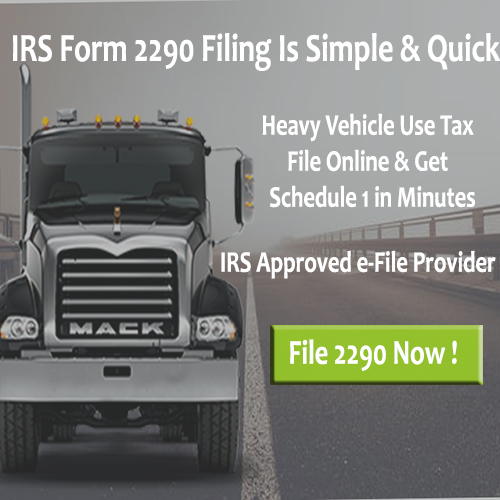 For the late filing of 2290 Tax form and Payment of Heavy Vehicle Use Tax, an IRS imposes the penalty. If you are not File 2290 Online within the 2290 Due Date then you must pay penalty along with interest. The IRS also impose a penalty for the fraud filings of 2290. If you are filing HVUT for the whole tax year lately, then the penalty is imposed for 2290 Filing. Filing Form 2290 Online by August 31st is equal to the 4.5% of the total tax due, assessed on a monthly basis if you impose to penalty. For the late filers, a monthly penalty of 0.5% of the total tax due occurs. Along with the penalty, 0.54% of interest also imposes on your filing tax. By the end of the Due Date, you can request an IRS for Late Filing of Form 2290. If you show a valid reason for late filing, an IRS may accept your request. 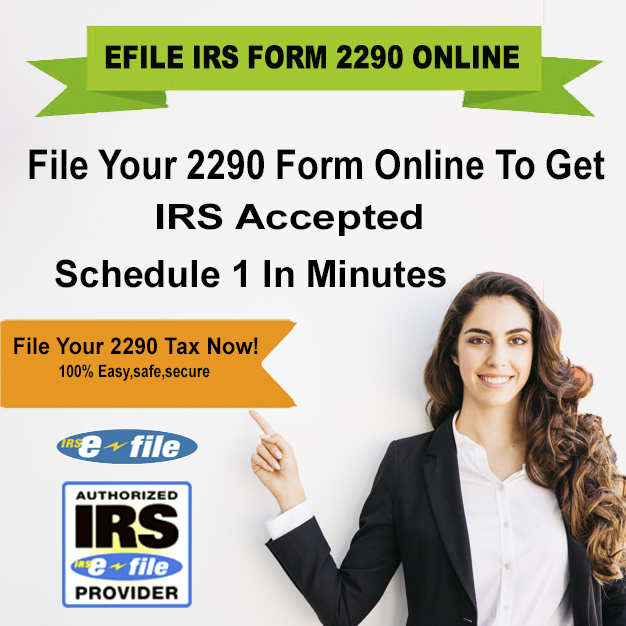 By paying some interest, you can Efile Form 2290. To avoid penalties and interests, you need to File within the IRS Form 2290 Due Date. The leader in the US filing tax services provider is Form 2290 Filing. 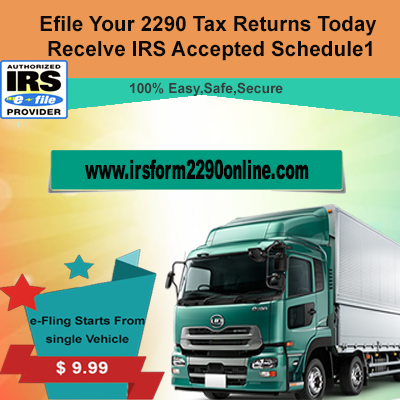 Start your IRS Form 2290 Online with us to get instant IRS Schedule 1. Call Us at (316) 869-0948.